Fusion Fluid drum mixers are designed for quick setup and enhanced portability while providing uniform drum mixing. Standard and custom designs are available to meet your needs. Fusion's drum mixers are versatile, lightweight, stable, and provide uniform mixing. Bung Mount mixers enter through and attach directly to the 2" NPT Bung that is common to most drums. Our version accepts Viton, EPDM, and FDA Rulon lipseals to provide additional protection for your product. 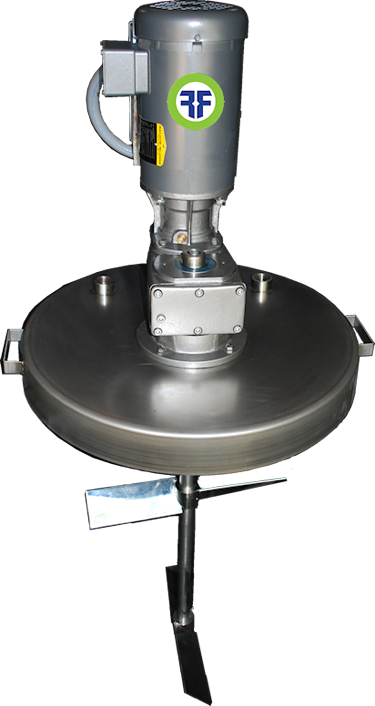 Drum Lid Mount mixers are mounted directly to a standard 22" diameter steel drum lid and can be moved from drum to drum. Custom heavy-duty lids also offered. Single or dual 316L stainless steel folding impellers are positioned on a 316L stainless steel shaft.